The Old Manor House is an idyllic country retreat occupying a commanding position in the famous princely town of Tetbury. With mature landscaped gardens and abundant sunshine from 8am-8pm in the summer months. This sophisticated property sits within an exceptionally private setting and has undergone an immaculate eight year conservation programme nurturing its 500+ year history whilst adding contemporary features like underfloor heating and a new ground source heat pump. The Old Manor House is an immaculate freehold grade II listed period house in a sought after position protected on all four sides from noise and traffic by gardens and high Cotswold stone walls. This property feels like it is deep in the countryside but is actually nestled in the centre of town with all amenities including popular restaurants within 5 mins walking distance (so you can comfortably stumble home after a meal). Tetbury consistently ranks amongst the top villages in the Cotswolds because it not only has a highly regarded historic town centre but it continues to grow and maintains a vibrant atmosphere with dozens of antique dealers, cafes, restaurants, shops, GP surgery, Hospital, a Music Festival, various well known Horse Trials and the largest classic car show in Gloucestershire. Tetbury is notably the home of HRH Prince Charles where he holds several annual events and receives guests through his charity The Princes Trust at Highgrove Gardens. Some years he can even be found turning on the Tetbury town Christmas lights. HRH Princess Anne lives 10 minutes away with a number of prestigious public events each year. 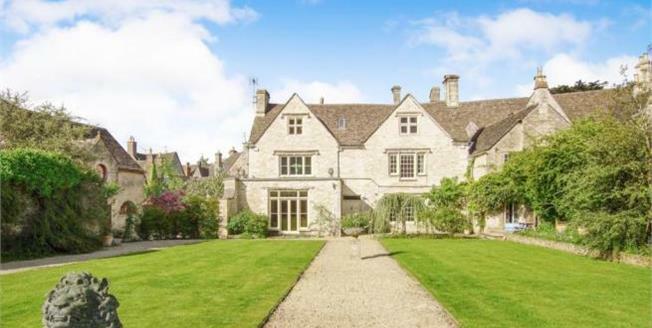 The Old Manor is an exceptionally fine property and is probably the largest residential home in Tetbury town centre dating back to the late 16th century. The house has a great deal of history including recorded rental payments to the King of 1 rose and 1 bag of cumin per annum. G/F Entrance Hall, Cloakroom, 2 Reception Rooms overlooking the private gardens, Gentleman's study, Medieval Dining room, 2 Kitchens (still in period condition -awaiting updating) 1/F 1 XXL Master bedroom suite X overlooking the gardens, 3 additional bedrooms, 21/2 bathrooms 2/F 3 exquisite original Tudor high ceiling top floor rooms and the final bathroom suite that can be a separate granny annex or generous office or artists' space if desired. The property has unusually high ceilings throughout including a large, central glass atrium ensuring natural light runs down the centre of the home all day long. Period features include very wide, solid oak floor boards in 5 rooms, 4 grand scale stone fireplaces (one of which is said to have been quarried from the same source as Malmesbury Abbey), original flagstone flooring on the ground floor and outstanding oak linen-fold wood panelling. Conservation products were a 'no expense spared' budget for natural lime, stone and chalk paints ensuring the maximum number of original features including a hidden slender staff staircase and a hidden dressing room were maintained. The town is surrounded with views and walks over an area which is renowned for its natural wildlife and designated as Cotswolds 'Area of Outstanding Natural Beauty'. Dog walking, cycling and recreational sports are all part of village life. Dogs are even welcome in most local shops. Westinburt Arborietum is 3 miles away with its open air concerts and bicycles paths, children's Gruffalo Garden and new attractions feature each season alongside its cafes. This is a property for a family with children and/or visiting grandchildren to enjoy in comfort with one of the largest play parks in the region directly across the street from the house offering football, rugby, basketball, bowls, two large "wave" skateboard zones, swings, military climbing nets and a fully equipped secure and sympathetic nursery playground. Dog walkers have easy access and are welcomed. There are many famous cycling trails running through the town and walks run both down along the old railroad lines and across into the wild growth green belts surrounding the town. Accommodation in the main house is arranged over three floors with potential to develop more bedrooms. All principal reception rooms and the majority of the bedrooms face south with open views onto the internal secluded gardens. There is a significant size exposed beam Tudor attic area with 3 rooms and a bathroom that could form part of a separate annex or office plan with flexible accommodation. The entrance hall and principal rooms on the ground floor are exquisitely arranged for easy flow during parties or events. The gardens have been designed for low maintenance and planted sympathetically to encourage garden wildlife full of birds, butterflies, bees and small mammals. The lawns were flattened and re-laid in 2015 with a very high-grade grass-breed and are suitable for croquet or bowls. The gardens have been designed to provide low maintenance planting whilst maximising nature and privacy through a mature yew topiary. This house hosts regular large-scale charity events including family weddings for up to 500 seated guests under marquee. Regular train services from nearby Kemble Station into Paddington scheduled from 80 minutes. Bath and Cheltenham within easy reach. Three challenging golf courses nearby. Racing at Cheltenham, Bath and Chepstow. Easy access to Badminton and Gatcombe horse trails. Kemble airfield (approx 8 miles) provides private jet access and a helicopter landing pad in this garden is also feasible with the correct permits.